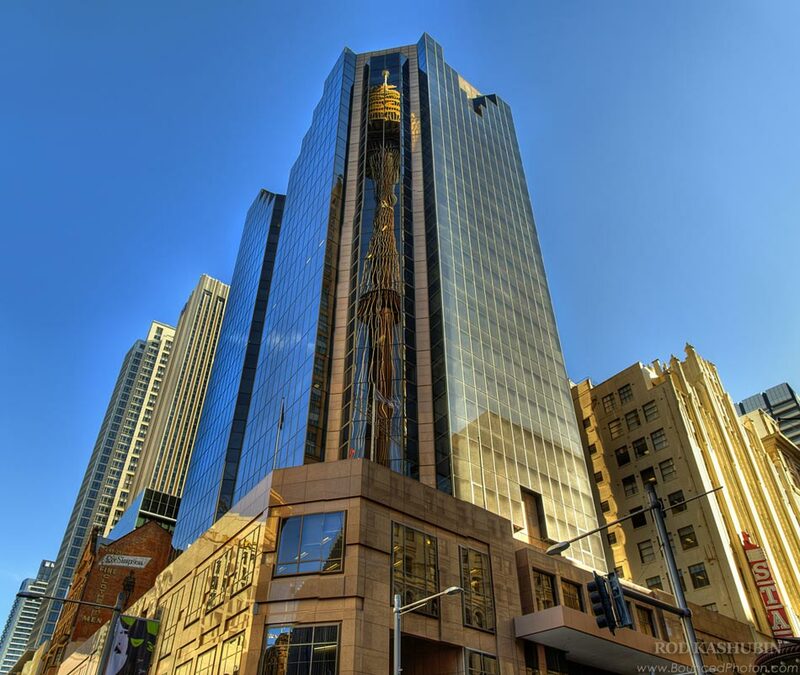 Sydney`s tallest building, Sydney Tower, gets reflected in 20 level office tower. Walking along the Pitt Street at one time I was stunned by clear and almost full size reflection of Sydney Tower in one of the glass buildings nearby. I observed it for a while moving around and noticing how reflection is changing and disappearing at some spots. After that I started to think about capturing the view noticing when would be the best light and the best time. Sometime later with Tower glowing in yellow light of setting sun and sky deeply blue I took around 27 shots handheld from different places to select just a few for further processing. For this image I chose 9 shots (3 vertical AEB sets with three -2,0,+2EV photos in each). 3 HDR files came out of those 9 images and finally they were stitched into one big HDR panorama. I then tonemapped it lightly and processed to enhance the contrast, color and few minor things like noise and shadows. It is not an alien invasion, not a frame from a sci-fi movie, but a living and breathing city, almost real and shockingly impressive. When I was standing there on the dark lane I heard the sounds of an invisible heart beating, breathing of an old building, saw the skin pulsing on a worn brick wall. It has really created an impression of an old organism being alive, calmly living there and serving humans for as long as it is required. What would it think about everything around it? Does it get irritated by the unpleasant smell or loud partygoers on Fridays? I Dwell In The City And The City Dwells In Me is a public artwork by Kim Bridgland, Adrian Hill, Aline Joyce and Theresa Schubert. 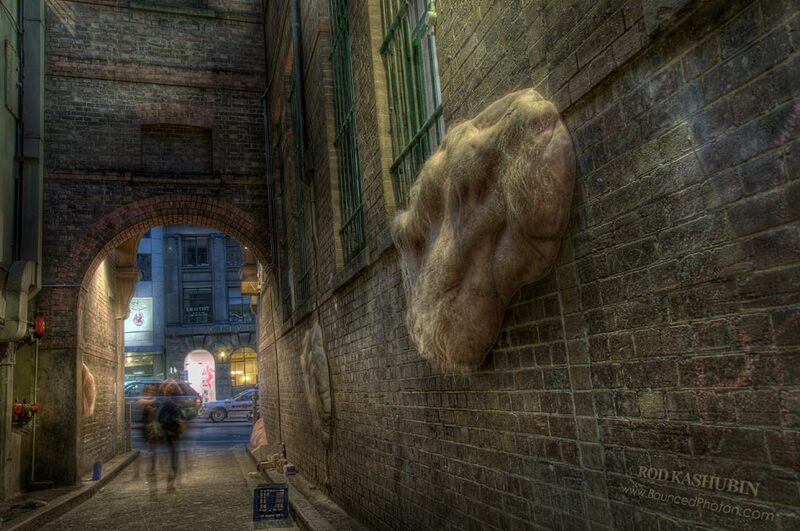 It is a part of a Laneways By George – Hidden Networks project. 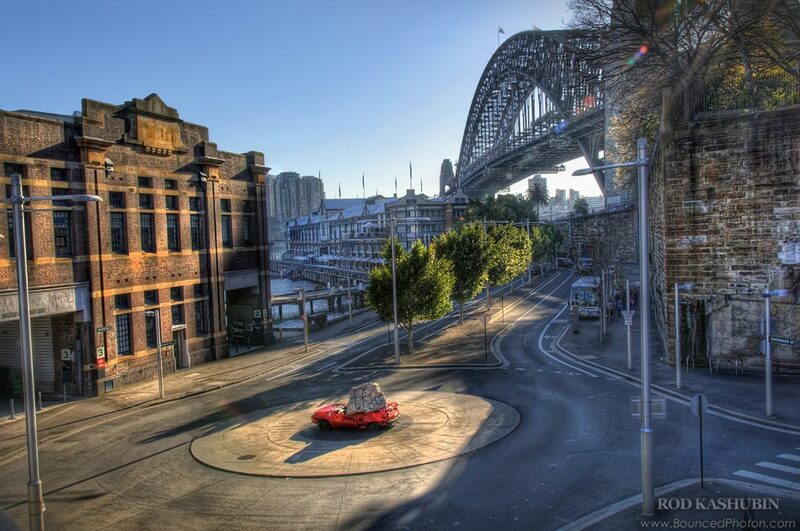 The exhibition consists of 8 creative works transforming hidden lanes and little streets in the Sydney centre. Installations are on display from 1 October 2009 until the 31 of January 2010. 3 RAW shots on a tripod combined into a HDR, tonemapped and post-processed. 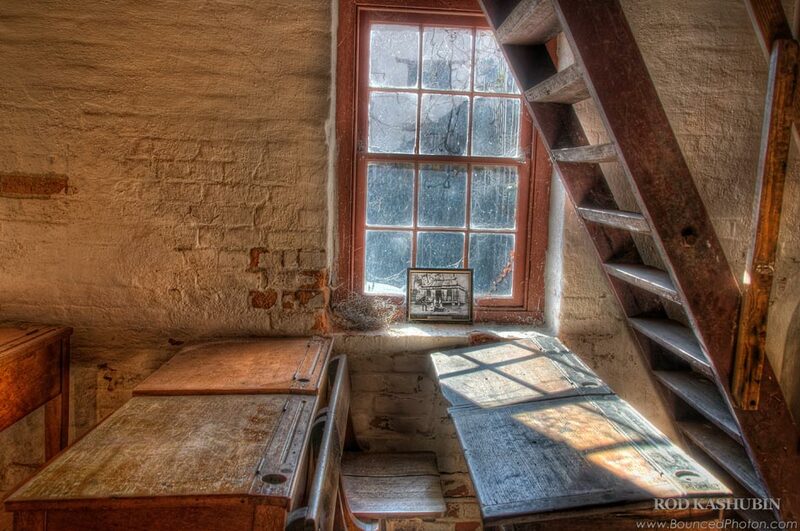 The 1880s classroom in Old Goulburn Brewery. Slate boards, dipping pens and ink on the scratched desks, learning manners, Latin and Old Math, wearing old clothes until it became rugged. How was it to be a student in the early years? Tone-mapped HDR out of 4 exposures. Did you ever visit a place where you completely forget what year it is now? Once we walked through the front gate of the brewery we thought we stepped into 1850s. I would call it The Time Machine of Goulburn city. You walk in and for $5.20 it takes you 150 years back (tastings included). Built in the middle of 19 century it is one of the oldest surviving breweries in Australia. Beautiful place, with a lot of history in it and it is history that can be seen, touched and photographed. And the best part – it is a working brewery where good old traditional ale is still produced. This was a situation where I wished I had a wider lens that my universal Nikon 18-200mm. The window was very close to a wall and it was hard to fill a frame. I managed to find a little square of space on the stairs leading to the 2nd floor and set up my tripod there. Next steps were easy: 3 RAW merged in HDR, then tonemapped and post-processed. Looking at the original image (one of three) and it is unbelievable how much details HDR processing is bringing out. Every texture bit of the wall and driy plants becomes visible. One evening few years ago I was walking at the Kings Cross suburb of Sydney. It was already dark, but a high-rise building above me did not have a single light in any of its 350 rooms. It was a somewhat scary to stand by this huge abandoned giant in a centre of the city. The sign on the top read ‘Millennium Hotel’. My mind started to picture apocalyptic stories about what might have happened to it in few years past the new millennium. I didn’t know that time that it was closed for the complete renovation. And here we go, $98m and few years later building is transformed into modern 37-storey Zenith Apartments tower. What a stunning view over the city it must be from its roof top. P.S. 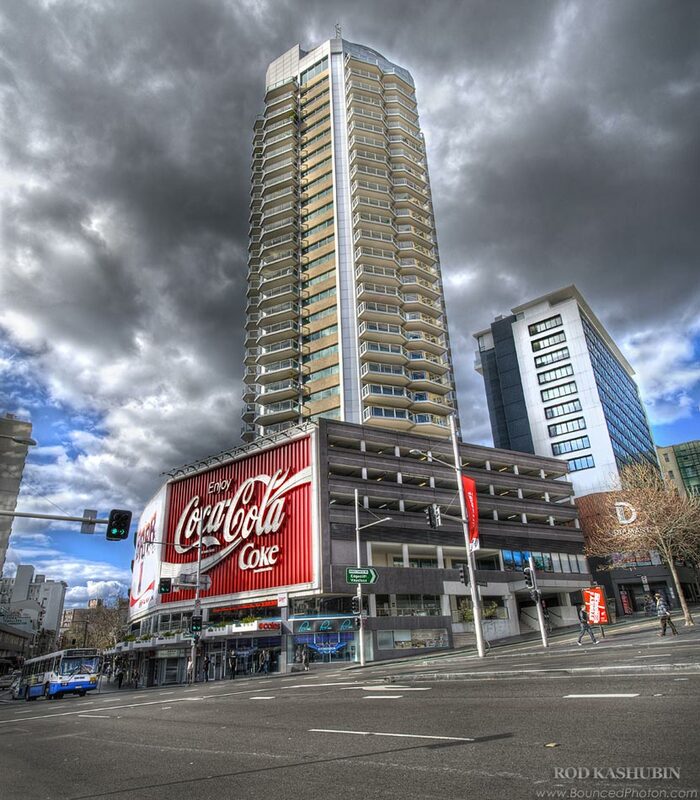 The Coca Cola Billboard is a character itself being the largest in the Southern Hemisphere, but I hope to cover it in another photo. This is a vertical panorama or a vertorama as it is called sometimes. I took 2 sets of 3 AEB shots from a tripod (one centering on the Coke sign and another one for the top of the building). Those were later combined into a single HDR (4129 x 4720) and then tonemapped. An accident? How did it happen? Where did that big stone fell from? Thoughts went through my head when I first saw this car. Still Life with Stone and Car is an object of art by Jimmie Durham. $7800, red hatch and a 2-tonne stone from a quarry at Australian Central Coast came together to create an artistic expression which is about monumentality, nature`s forces and certainly an original way of spending money. Friday morning HDR out of 3 exposures. Tonemapped, contrasted, dodged, burned, cropped a bit and served right on the display for your enjoyment. 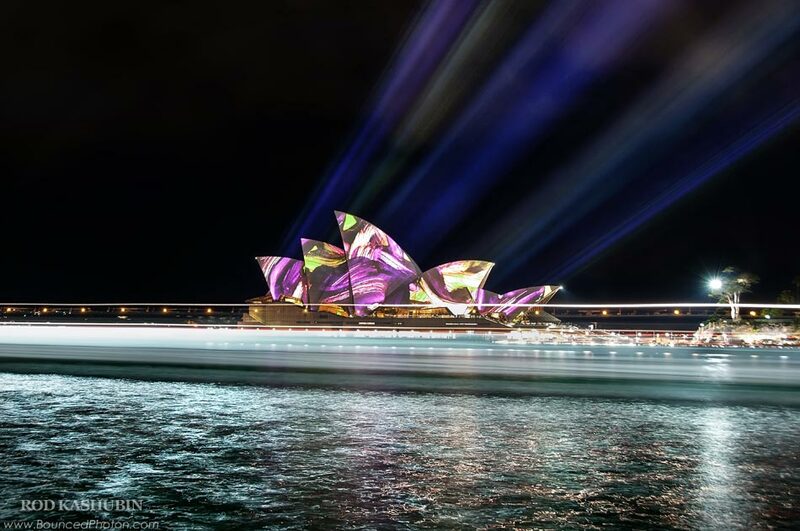 Lighting the Sails was a spectacular light projection onto Sydney Opera House orchestrated by Brian Eno. Every night for three weeks during Vivid Sydney 2009 festival city icon was a canvas glowing with colorful light patterns. Sometimes it is hard to anticipate what effect the long exposure would create on a photograph. And this was one of those times for me. I was so focused on capturing Sydney Opera that I did not notice a cruise ship coming into Circular Quay Ferry Wharf. I pressed the button on my remote shutter release and only then saw it slowly entering the shot. ‘Alright, this one is wasted’ I thought. But then, looking on the preview I saw what an amazing effect ship`s lights created on the water and held off deleting it. This is a 20sec long exposure shot from Overseas Passenger Terminal with camera on a tripod. I later made a bit post-processing mainly adjusting the contrast and enhancing light details with selective dodge and burn. Almost same composition, yet how different these photographs look. The only thing that really varies here is light. First photograph was taken at midday when lighting is harsh and contrasts are strong. The second shot, on another hand, was made during the golden hour when lighting is softer and more pleasant. Golden hour is usually the first or last hour of sunlight during the day when lighting is magical. This is one of the nature`s special effects available to everyone twice a day. P.S. There is a little trick with the second photo. You might wonder what is it or you might already guessed. It`s reflections from numerous windows of the building across the street that add additional depth to the photograph. On one evening I was lucky enough to visit Vivid Sydney 2009. That was an amazing festival of music and light happening all around Sydney. 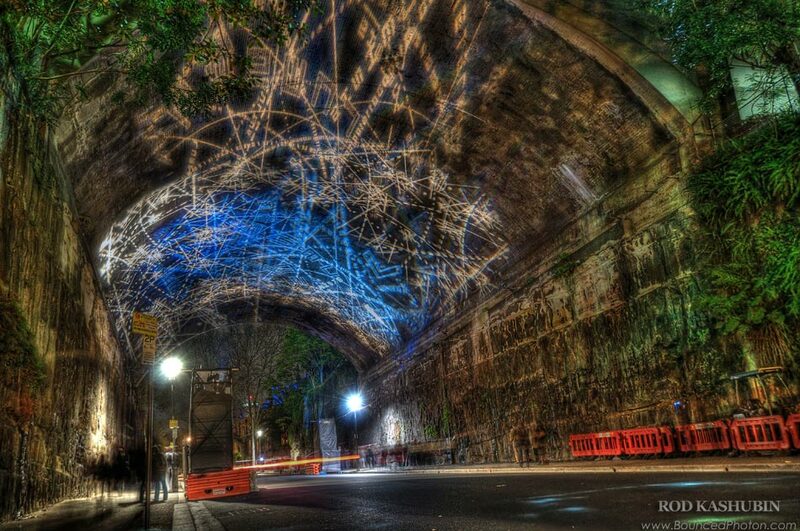 This picture shows one of the installations called Rocklights, the light projection in Argyle Cut by German artist and stage designer Ingo Bracke. Argyle Cut itself is a tunnel that was cut through the sandstone by convicts with basic digging tools at first and then by explosives. That was a huge job for year 1868 and it is no wonder it took 25 years to complete. 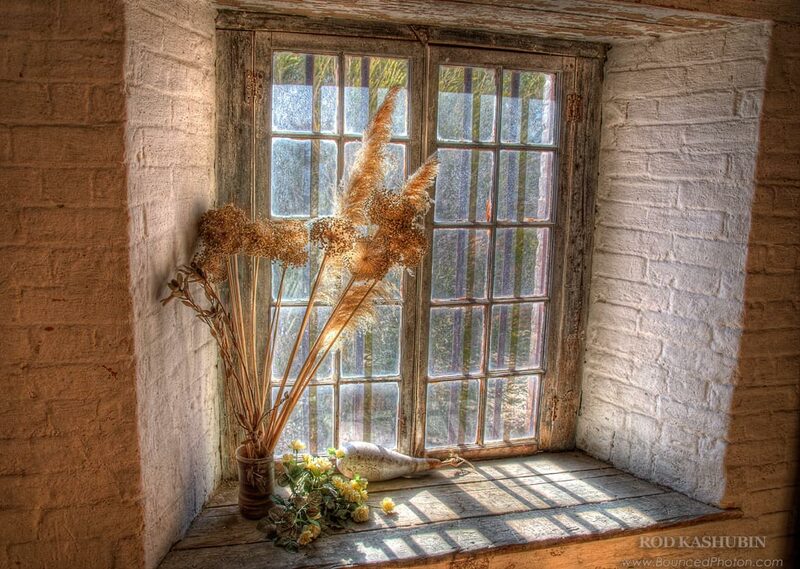 The picture is tonemapped HDR from a single RAW file. The shot was taken from a tripod with 8sec exposure. Located on the mountain peak 850m above the sea level Mount Irvine is a tiny settlement in the area of Australian Blue Mountains. 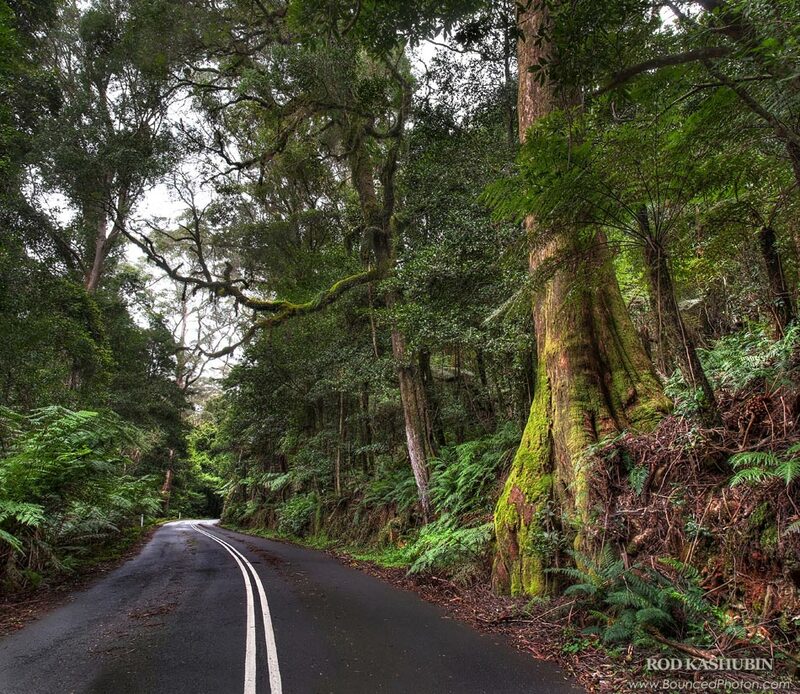 Cool wet climate and rich basalt soil for millions of years provided perfect environment for the rainforest to grown here. Never before I saw such a magical, thick and absorbing forest. It is so dense that sound sometimes is having difficulty getting through it. A number of times when I was standing at the middle of the road with my tripod taking this photograph I just could not hear a car driving out of the curve 50m behind me. I took a total of 18 shots to create a tall HDR panorama (2 columns of 3 bracketed sets of -2/0/+2EV). This is a tone-mapped HDR of approximately 60% of the resulting panorama.